This item does not qualify for any discounts or free shipping. Strictly limited to 6,000 numbered copies! Deluxe audiophile pressing on SuperVinyl compound at RTI! It's impossible to exaggerate the stature, brilliance, and splendor of Bill Evans' Portrait in Jazz. The result of Evans having collaborated just eight months prior with Miles Davis, John Coltrane, and company on the watershed Kind of Blue and soon after finding a bassist (Scott LaFaro) who suited his style and boasted world-class chops, the 1960 album established the standard that all similarly configured jazz trios continue to follow. This is the moment the bass, until then relegated to accompaniment status, gets an equal say in the compositions with the piano. That Evans, LaFaro, and drummer Paul Motian deliver each passage with resplendent soulfulness, poetic modality, and sublime empathy only adds to its charm. Not to mention Orrin Keepnews' demonstration-quality production that now sounds utterly transcendent. Mastered from the original master tapes, pressed at RTI on MoFi SuperVinyl, and strictly limited to 6,000 numbered copies, Mobile Fidelity's opulent UD1S (UltraDisc One-Step) box set provides sonic and tactile experiences that match the quality of the music within Evans' studio breakthrough. You'll enjoy deep-black backgrounds, pointillistic details, and staggering dynamics. 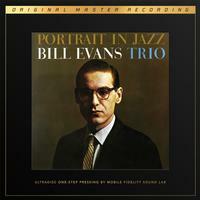 Experienced via UD1S, Portrait in Jazz places Evans and his esteemed colleagues in your listening room. Every note, harmonic, and movement captured by the microphones are reproduced with exquisite accuracy and wowing clarity. Close your eyes at you're practically at Reeves Sound Studios in New York City in late December 1959. The lavish packaging and luxurious presentation of Mobile Fidelity's Portrait in Jazz UD1S pressing befit its extremely select status. Housed in a deluxe box, the collectible version contains special foil-stamped jackets and faithful-to-the-original graphics that illuminate the splendor of the recording. Aurally and visually, it exists a curatorial artifact meant to be preserved, poured over, touched, and examined. It is made for discerning listeners that prize sound quality and creativity, and who desire to fully immerse themselves in the art — and everything involved with the album, from the images to the textures and liner notes. Pored over by generations of listeners and musicians alike to grasp the group's then-revolutionary approach, high-wire interplay, and seamless chemistry, Portrait in Jazz retains a blend of timeless classicism and forward-looking modernism that makes it as revered now as it was nearly six decades ago. The three instrumentalists operate in complete unison and achieve supreme democratic balance. Expressing their intent via shared conversations, they alight on sublime pieces flush with thematic discovery, swing-based dialogue, and raw feeling. Writing for The Penguin Guide to Jazz, Richard Cook and Brian Morton attempt to put it all into context: "The bassist's melodic sensitivity and insinuating sound flowed between Evans and Motian like water...the playing of the three men is so sympathetic that it set a universal standard for the piano-bass-drums setup (that) has persisted to this day." Indeed, hearing Evans and his mates put their signature stamp on standards ("Come Rain or Come Shine," "Witchcraft," "Autumn Leaves") and originals ("Peri's Scope," "Blue in Green") is akin to witnessing new trails blazed for generations to come. Their Evans-deemed "simultaneous improvisation" teems with freshness and sensitivity, their rhythms and lines pregnant with an irresistible combination of vulnerability, confidence, energy, and elan. To even think Portrait in Jazz marked the first session with LaFaro boggles the mind. To then consider the man Evans credited as "more or less the father or the wellspring of modern players" would be dead 18 months after completing the record in the studio invokes a cascade of emotions — and lends even greater gravitas to the work's import. History only allows for so many "firsts." Portrait in Jazz claims such a designation. It meets every definition of must-have and you'll never hold or hear a better copy than Mobile Fidelity's UD1S edition. 6. What Is This Thing Called Love?